“Blood Blockade Battlefront” (“Kekkai Sensen” or “Bloodline Battlefront”) tells the tale of Leonardo Watch (to the left, grasping a beer mug), a photographer who has come here to help his ailing sister. But for some strange reason, a mysterious entity gave him the “All-Seeing Eyes of God”, granting him a variety of ocular powers (he normally wear a special set of goggles). He ends up being recruited by the organization “Libra”, who is tasked to clear the streets of trouble and prevent the horrors of this city from spreading to the outside world. Now, it does help that NYC….I mean, HSL, is blanketed in a perpetual fog, so you can’t really see what’s going on or going down or going away, but it makes for overall dreary days. The leader of Libra, Klaus Von Reinherz, who is a caliber of werewolf (upper right, in tie and vest) wants the best to help with keeping these mean streets as safe as possible. He is always gentlemanly and refined, even when he has to dispatch people. Other members of Libra include K.K. 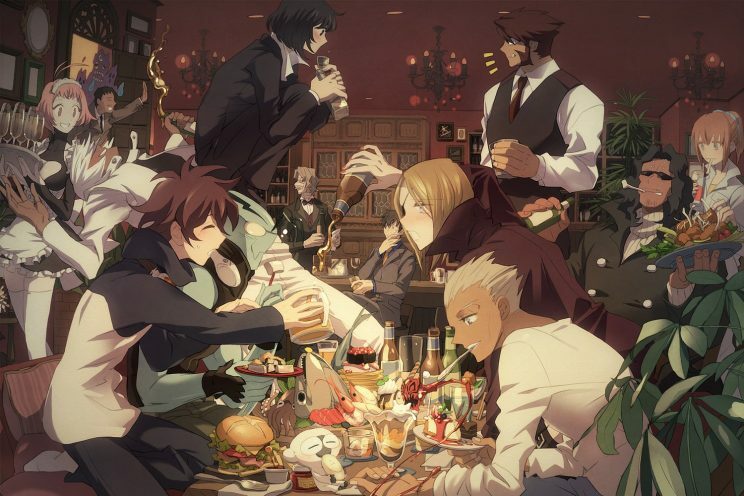 (eyepatch, pouring the beer), Zapp Renfro (down in front, manipulating his blood), Chain Sumeragi (crouched above Leo) and Steven A. Starphase (dead center, way in back, hand on chin). There are more members, but this is the core. The tales are about trying to live a normal life when all about you is nowhere near normal. You want normal, move to White Plains, OK? There is a very touching episode, Number Six, “Don’t Forget to Don’t Forget Me” which shows that, perhaps, demons and people could live together. This stands out in stark contrast to the rest of the series, where there is unrelenting violence and destruction. One gets the feeling that if the demons wanted to, they could flood through the portal and make life really….interesting. I recommend this series highly. Usually, I get tired of demon/monster shows as it ends up being endless fights over one thing or another, but this show has a real direction and purpose and the demons and monsters are a means to an end to achieve that goal. Yeah, OK, maybe the ending is a bit maudlin, but it fits into the show so well. It does get a tad tiring to see Leo absorb a huge amount of abuse from his co-workers (almost part and parcel for shows of this nature), but everyone gets to sing their aria and everyone has to clean up after the elephant, so things work out in the end. Things are off-kilter and out of step in this new world, but this is the new normal, so everyone learns to deal with it. But I bet you still can’t find decent parking ANYWHERE! And remember, it’s first run until you’ve seen it. Beat me if you can. Tagged Action, Blood Blockade Battlefront, Fantasy, Kekkai Sensen, Supernatural.